We’ve been taking Declan to our favorite local coffee shop since he was a baby. Sometimes it’s a family affair. Sometimes it’s just me and him. When he was weeks old, we rocked him in his car seat while he sucked on a pacifier and watched people. When he started pawing at our food, we broke banana bread for him to stuff in his cheeks. 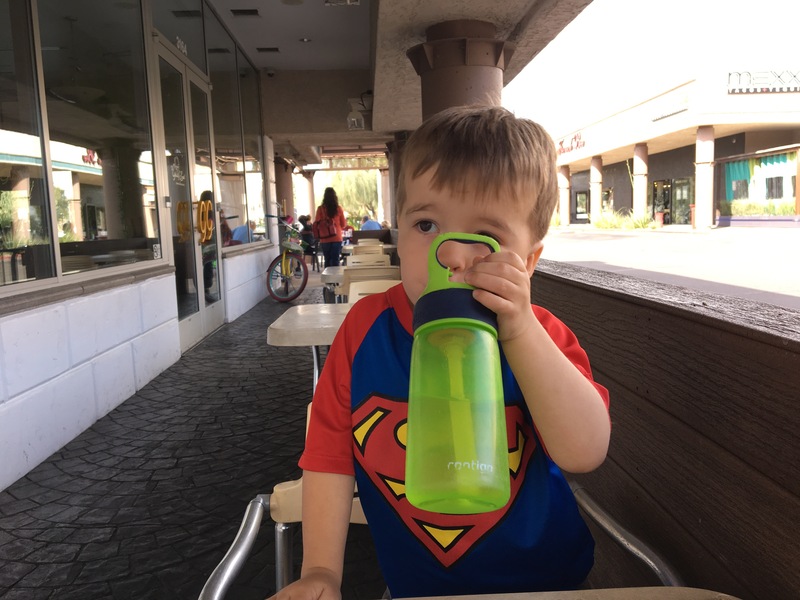 When he started talking, we’d stop by on the way to daycare, sit on the patio, and let him point out cars and airplanes in a high squeaky voice. Since he’s been going to school, it’s more of a weekend activity. Increasingly, it’s a time for Colleen and me to catch up while he plays an app or watches a video and shamelessly eats from our plates while (sometimes) ignoring his own food. When he gets a new toy or book, he wants to show it off to the baristas. They know his name and his interests. They rub him on the head like an aunt or uncle would. He has grown up there. We went back to the coffee shop again this morning before school, a rare day of leaving the house quickly and ahead of schedule. In fact, when I told Declan we had time to go if we left immediately, he dropped everything he was doing and went straight to the door. I’ve got him trained! We got a table in the back and shared a bialy and some cinnamon toast. He “read” me his Team Batman book which he has memorized, almost word for word. I marveled at how big he is, and how much fun he is to talk to. After I dropped him off at school, I noted how relaxed I felt. It had been a good morning. Maybe it was the coffee talking. But I think it was really the warm feeling of a return to an old habit, a simple activity that over-delivers on the pleasure it brings. He’s a great kid and I’m glad only three years have passed. That means there are many more coffee shop trips to come.